The British Heart Foundation and Resuscitation Council have developed a new AED location sign and supporting information poster. 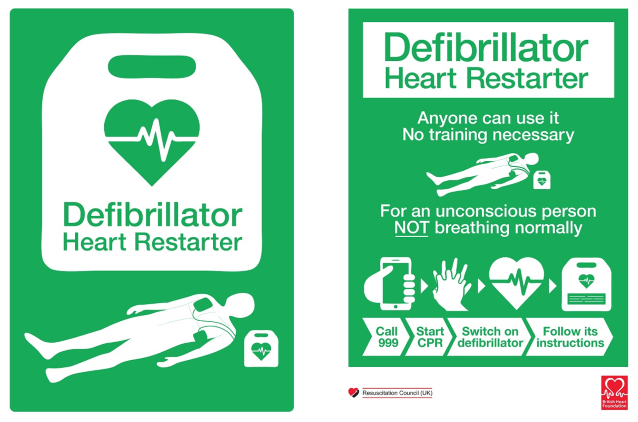 The new AED sign, supporting poster and information can be found on the Resuscitation Council website. Both the Level 2 Award in Emergency First Aid at Work and the Level 3 Award in First Aid at Work have been reviewed recently. During the review, it was decided that the Emergency First Aid at Work qualification should be re-levelled and, from October 2017, it will be a Level 3 qualification. The content of both qualifications has changed very little, but changes have been made to the assessment criteria to ensure the focus rests on the key areas of the qualifications. Additional guidance has been added to the structure of both qualifications to ensure that learners and training providers have a clear understanding of all aspects of the qualifications. The new Level 3 Award in Emergency First Aid at Work and Level 3 Award in First Aid at Work qualifications will be launched on the 1st October 2017. The Department of Education have launched a new statutory framework for the Early Years Foundation Stage. This is a mandatory framework that all early years providers in England must adhere to. The new framework came into force on the 3rd April 2017 and sets the standards for learning, development and care of children from birth to five years old for maintained schools, non-maintained schools, independent schools (including free schools and academies), all providers on the Early Years Register and all providers registered with an early years childminder agency (CMA). Early years providers must have at least one person, who holds a current full paediatric first aid qualification (this is the 2 day (12 hour) paediatric first aid course), on the premises and available at all times when children are present, and must accompany children on outings. Childminders, and any assistant who might be in sole charge of the children for any period of time, must also hold a full current Paediatric First Aid certificate. Providers should take into account the number of children, staff and layout of premises to ensure that a paediatric first aider is able to respond to emergencies quickly. All other child care staff who are included in the mandatory staff to children ratio, must hold either a full Paediatric First Aid (as above) or Emergency Paediatric First Aid qualification, (this is the 1 day (6 hour course), and gain this qualification within three months of starting work. Exceptions can be made if a person is unable to gain a paediatric first aid qualification if a disability would prevent them from doing so, but wherever possible they should still attend a paediatric first aid course and obtain a certificate or written letter of attendance. New legislation was passed in Westminster this week to allow schools in the UK to keep spare adrenaline auto-injectors (AAIs) for emergency use. AAIs deliver a potentially life-saving dose of adrenaline in the event of a severe allergic reaction (anaphylaxis). The legislation comes into effect from 1 October 2017. A working group, made up of representatives from the Anaphylaxis Campaign, Allergy UK, the British Society for Allergy & Clinical Immunology (BSACI), the British Paediatric Allergy Immunity and Infection Group (BPAIIG), and the Royal College of Paediatrics and Child Health (RCPCH), has campaigned over the last two years for the Government to amend the Human Medicines Act to allow schools to buy AAIs from a pharmaceutical supplier, without prescription, for use in emergencies. The working group and their respective organisations have welcomed the new legislation which allows school staff to administer an emergency AAI to any child who has been assessed as being at risk of anaphylaxis. Their campaign gained a huge groundswell of support from parents and teachers: over 1600 parents/carers and 800 teachers completed a survey in 2015 to assess backing for the campaign: over 99% of parents and 96% of teachers supported the proposal. The survey formed a crucial part of the evidence presented to the Department of Health. A public consultation conducted by the Department of Health this year also found overwhelming support for a change in the law to allow schools to hold spare AAIs, without a prescription, for use in emergencies. “The rise in food allergy among young people is posing a significant risk for schools who can be faced with a life-threatening situation requiring urgent action. One in five fatal food-allergic reactions in children happen at school. Schools can now purchase the first-line treatment for anaphylaxis, without a prescription. While not compulsory, we hope many schools will take advantage of this change as part of their duty of care to those children who are at risk of anaphylaxis. This is likely to increase awareness and highlight the need for staff to be trained to recognise and treat anaphylaxis in school. The working group is now developing a website which will provide online resources to support school staff. For a parent of a child at risk from anaphylaxis, this will provide valuable reassurance that their child can receive prompt emergency treatment while on school premises. There has been a recent announcement that schools will soon be able to hold a spare adrenaline auto-injector pen for use on children. These will be available for anyone to administer in the case of anaphylactic shock. This has been something that has been campaigned for by several organisations, including the Anaphylaxis Campaign alongside Allergy UK, The British Society for Allergy & Clinical Immunology (BSACI) and British Paediatric Allergy Immunity and Infection Group (BPAIIG). The legislation for this is likely to be in place by October this year (2017). The way this appears to be worded is that the spare adrenaline auto-injectors will be available to administer to children, it does not mention staff being able to administer to other staff. As from 1st September 2016, if you are to become part of the early years environment, it is likely you will have to have a paediatric first aid certificate. This will apply to all newly qualified staff possessing a Level 2 or Level 3 childcare qualification. They will need to hold either the full paediatric first aid certificate or the emergency paediatric first aid certificate to be included in the required staff to child ratios. Much of this change is said to be in relation to the campaigning of the parents of Millie Thompson who unfortunately passed away in 2012 at nursery from choking. As such, early years providers in England who have all of their staff trained in paediatric first aid will be able to apply for the Millie’s Mark. This is a new scheme that will show a dedication to keeping children safe in the early years setting by having all staff trained in vital lifesaving skills. For more information about Millie’s Mark, click here. Ablation or catheter ablation as it is sometimes referred, is a treatment that is used to control or correct certain types of abnormally fast heart rhythms. This could be something like Atrial Fibrillation (AF) or Superior Ventricular Tachycardia (SVT). A cardiac catheter (thin, hollow, flexible tube) is inserted in to the body via an artery in the wrist or in the groin, it is then fed around the body to the heart to where the abnormal signal is located. The medical professional will then use either radiofrequency waves (radiofrequency ablation) or freezing (cryoablation) to destroy the tissue. This procedure can be repeated if it does not work the first time. It can take several weeks to see whether the procedure has worked or not. Diabetes can be diagnosed using various tests, some of these tests are used by people who are already diagnosed with diabetes to check their blood glucose levels. These are often done when someone has the symptoms of diabetes so that their blood glucose levels can be checked. Sometimes this is done straight away (without fasting), sometimes it is done as a fasting test. This is where the person will be required to not eat for around 8 hours before hand. Drinking water is permitted during the fasting period. This test is often carried out by people who are already diagnosed diabetic to check their current blood glucose levels. This test requires fasting of 8 hours before the blood glucose level is checked. The next part of the test will require the person to drink a sugary drink. After 2 hours they will then have their blood sugars checked again to see how the body is dealing with the drink. This blood test measures the average blood glucose level for the previous 2-3 months. It is a way of checking a persons long-term diabetic control. If the person has high levels of HbA1c (glycated hameoglobin) in their red blood cells, it means that the persons blood glucose levels have been high over the last few months. No fasting is required for this test. Unfortunately diabetes cannot be cured at present, but it can be managed successfully with lifestyle changes and medication. A type 1 diabetic will require insulin injections, although new developments such as pumps are sometimes being used. A type 2 diabetic will be advised to adjust their lifestyle such as losing weight if they are overweight, stopping smoking, doing more physical activity and eating healthily. If this does not help, or does not help enough, then tablets will usually be prescribed. It is quite likely that eventually the type 2 diabetic will need to have insulin injections. The recent European Resuscitation Council review of a number of first aid protocols suggests there is a need in certain circumstances for first aid kits to contain haemostatic dressings and tourniquets. The view of HSE is that the inclusion of these items is based on your First Aid Needs Assessment. workplace first aiders have training in when and how a haemostatic dressing is applied. Examples of sectors that may benefit from additional training in the use of tourniquets based on RIDDOR data include: construction, agriculture, forestry and some aspects of manufacturing. I attended your FPOS training course at JCB Wardlow Quarry June/July 2017. I’d just like to thank Duncan for the course he led. Well delivered in an easy to understand language. The reason for penning this mail is two fold. Firstly myself my wife and youngest daughter were involved in the Barcelona terrorist attack last August. I used the knowledge gained on the the course to administer some first aid to a young lady who was in some distress. “First Aid training during the beginning years of my career within the Fire & Rescue Service consisted of a half day first aid at work course. This qualification, staff believed, was below the required standard for our profession. When the service began looking at upgrading its medical capabilities front line staff were sceptical about what this might entail and where it may lead.